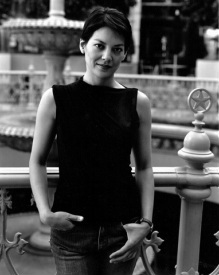 Anne Akiko Meyers has been described as a ‘trailblazing violinist’, one who is constantly ‘charting her own course’. ‘Playing that flows from the heart’, ‘her playing was unspooled with impressive refinement, emotional freedom and tonal depth ….molding her phrases like a singer’ is how the NY Times has described Anne Akiko Meyers. Celebrated as one of the world’s premiere concert violinists, the renowned soloist, chamber musician, recording artist and educator has sought to reach wider audiences by premiering new works written for her and showcase under-performed or rarely heard works with a quest for experimentation and open dialogue.Meyers has been a regular guest at some of the most prestigious venues including Carnegie Hall, the Concertgebouw, Hollywood Bowl, Lincoln Center, Suntory Hall, and the Sydney Opera House. She has appeared as soloist with orchestras such as the Berlin Symphonie-Orchester, Boston Symphony, London’s Philharmonia Orchestra, Los Angeles Philharmonic, Orchestre de Paris, Montreal Symphony, Moscow Philharmonic, New York Philharmonic, Philadelphia Orchestra, Royal Concertgebouw Orchestra, Royal Philharmonic, Swedish Radio Orchestra, Sydney Symphony Orchestra, Tokyo’s NHK Symphony, Toronto Symphony, Vienna Symphony, and the Warsaw Philharmonic. Her extensive discography can be found on the Avie, Camerata, Hyperion, Koch, Naxos, RCA Victor Red Seal, RPO, SonyBMG and Warner Classics labels. In early 2009, Koch Records launched critically acclaimed ‘Smile’ that includes several premieres, including the ‘Fantaisie’ by Olivier Messiaen and works by Chaplin, Harlen, Piazzolla, Schubert and Taki among others. Her next album, entitled ‘Dreams’ will be released in early 2010 and include works with harp and piano on Koch Records. Meyers has premiered a number of works by composers such as David Baker, Mason Bates, John Corigliano, Karl Amadeus Hartmann, Jennifer Higdon, Olivier Messiaen, Akira Miyoshi, Arvo Part, Manuel Ponce, Somei Satoh and Joseph Schwantner. Meyers recently collaborated with jazz legend Wynton Marsalis, who wrote new cadenzas for Mozart’s G Major violin concerto and which she premiered to great acclaim with the Utah Symphony. Starting her studies at 4 years old, she first performed with a local orchestra at the age of 7, then burst into prominence at age 11, when she twice performed on ‘The Tonight Show’ with Johnny Carson and appeared with the Los Angeles Philharmonic. The following year she made her New York Philharmonic debut with Zubin Mehta conducting. She was soon performing throughout the United States, Japan, Australia and Europe and by the time her debut disc of the Barber and Bruch violin concertos with the Royal Philharmonic Orchestra was released at age 18, she was recognized as one of the stars of her generation. Meyers was awarded the prestigious Avery Fisher Career Grant, the only artist to be the sole recipient of this annual award at the age of 23. Her numerous television credits include an A&E Network telecast from the Casals Festival with the Montreal Symphony, a PBS broadcast with the Boston Pops Orchestra and John Williams, her appearances on “The Tonight Show” with Johnny Carson as well as the “Emmy Award Show.”  She performed in front of 750,000 people in Sydney, Australia’s Harbour, celebrating their 250th Bicentennial, and for dignitaries around the globe, including the Emperor and Empress of Japan. Meyers has been featured in numerous print and television commercials including being selected to be photographed by Annie Leibovitz for the Anne Klein “Women of Substance” fashion campaign that appeared in magazines around the world. Meyers studied with Dorothy DeLay and Masao Kawasaki at the Juilliard School, Josef Gingold at Indiana University and Alice and Eleonore Schoenfeld of the Colburn School of Performing Arts in Los Angeles. She recently was chosen as Regent’s Lecturer at the University of California, Los Angeles, the first time in their history to bestow this honor on a violinist. In the fall of 2009, Meyers joined the Butler School of Music at the University of Texas at Austin as Professor of Violin. She performs on the “Royal Spanish” Antonius Stradivarius violin dated 1730 that once belonged to the King of Spain. More information may be found at her website, www.anneakikomeyers.com.